Join Progress Fitness on April 15th for prizes raffles and money saving discounts! Progress Fitness Center, located at 11 Progress Ave. Tyngsboro, MA is having a Membership Drive on April 15th from 5am-9pm, running all day. Join the staff for a tour of the facility and answering any questions you may have. There will be raffles and prizes as well as a 50% savings on the enrollment fee! 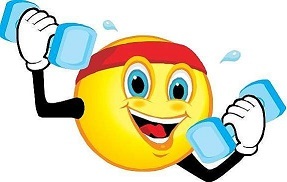 Mention you saw Progress Fitness on the Friends of Kevin social media pages and they will wave the fee completely! Progress Fitness Center is a 15,000 square foot full service gym with a family friendly atmosphere that caters to all fitness levels, they aren't over crowded so you will always find that when you come in you are able to complete your workout how you planned to. A clean, comfortable, and safe place to get your workout on with experienced trainers and friendly staff there to help! Visit the Progress Fitness Center website for more information on group classes, individual training and the many ammenities they have to offer, including child watch, sauna, juice bar and more. If you’re trying to succeed on a fat loss diet plan, one thing that you must be preparing and planning for is those days where you just can’t seem to make time. The thought of cooking a meal in itself is almost too much too handle as you’re stressed out trying to fit in everything that you need to be doing. Fortunately, it doesn’t have to be this way. By taking into account a few fast fixes, you can easily maintain your diet even on the busiest of days. Let’s look at some quick suggestions to get you going. The very first meal on the go is simply to open up a can of tuna, add some salsa, and then add in whatever frozen vegetables you happen to have on hand. It’s a good idea to keep some frozen vegetables in the freezer as these can literally be ready in seconds and will make sure you get the nutrition that you need. Place this all in the microwave for a couple minutes or in the oven if you prefer. Next, if it’s your breakfast meal that you’re in a rush for, go in for some oatmeal and protein powder. Simply prepare the oatmeal according to package directions which should only take 2-3 minutes and then stir in your favorite flavor of protein powder. Top with some berries and nuts for healthy fats and you’ll be all set to get your day started. Finally you might also want to consider creating your own soup. This can be done quickly and easily by simply heating up some low sodium chicken broth, adding some frozen shrimp and then tossing in some fresh or frozen vegetables along with some minute brown rice for carbohydrates. Soup is especially filling and a fantastic way to boost your nutrient intake as well, so you’ll definitely want to make sure that you’re taking this one into consideration. So there you have some quick and simple meals that you should consider utilizing on your busiest of days. Whatever you do, just don’t turn to fast food or convenience food. With just a slight amount of preparation, you can easily eat well and stick to your diet. So you have the busiest of busy days ahead of you and know that there will be no time to get the gym as you usually do. So, does this mean you should forgo your workout entirely? Or is it possible to salvage it with a few techniques? Fortunately, if you keep a few things in mind, you can get an effective workout in in just ten minutes or less. Let’s look at what you should know. First, choose three compound exercises to perform – one lower body movement and two upper body movements, a primary chest movement and a primary back movement. Between these three exercises, you will be able to effectively target every single muscle group in the body, thus cutting back on the total volume of exercises that must be completed within your protocol. Next, you’ll perform two full sets of this exercise, making sure that you are giving 110% effort. This not only means lifting as much weight as you can, but using the highest rep range possible as well. These two combined is what will bring you to a very high intensity level that will create the training stimulus even though you are only in the gym (or your living room) for 10 minutes. Finally, the last thing to know is that you’ll want to keep the rest periods short. First, since you clearly don’t want to doddle during the workout or that will increase the length, this helps you get in and out quickly. Then in addition to that, keeping the rest periods shorter will help you create a good metabolic effect in the body, which will then send your metabolism soaring for hours after the session is completed. If you want to work on burning up more body fat, this is a great way to get the job done. This single workout could mean the difference of a few hundred calories burned over and beyond what you normally would had you skipped that workout that day. A very short, but highly intense workout is a great way to kickstart a slow metabolism and allow you to burn fat far faster than ever before. So don’t skip over that workout. Almost anyone can carve out 10 minutes from their day so use these techniques and get it in. enjoyable if it feels like your own." 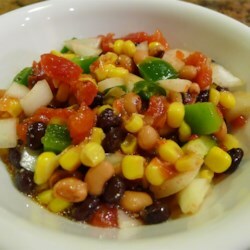 In a medium bowl, combine black-eyed peas, black beans, corn, onion, green bell pepper, jalapeno peppers and tomatoes. Season with Italian-style salad dressing and garlic salt; mix well. Cover, and refrigerate overnight to blend flavors. Mike has a great knowledge of body mechanics, muscle function and is capable of determining the individual abilities of his clients. Kettlebells are a tremendous exercise and I am enjoying the results. Mike's positive attitude is a great asset to his willingness to work with his clients at their own level and to push them to their maximum potential. He instills confidence and encourages you to want to work further and apply yourself more diligently. Mike is alway watching technique and form during kettlebells, which is another asset to Mike being an A+ instructor. Mike is a great trainer. There are all sorts of challenges with kettlebells. I find his strong point is his comprehensive knowledge of the musculature anatomy of the body. He combines that with his expertise in kettlebells and it's a terrific synthesis of a complete body work out. He is sure to WATCH and INSTRUCT you as you perform correct form. I also see Mike as being attentive and willing to be flexible in his program. He will also be considerate of any discomforts or soreness you may be experiencing. He is understanding and considerate and he knows JUST what you are capable of. And he pushes when he should. That is what will make you appreciate Mike as a kettlebell expert! I've been with Michael Bistany only a short time and already am seeing results. As I have had back issues for years I need to be confident in the leader of my fitness instruction and Michael has won that confidence in me. He has adapted my exercises to meet my needs and selects workouts to target areas most important for me to strengthen first. I look forward to an ongoing program. Thanks, Michael!